With 10 years of innovation and professional design team at United States. Inspired by people and technology to create quality products that make the world get better connection and make life easier. Dison's strategy begins with a passion for building amazing product and a commitment to serve its customers. Dison's portfolio of brands offers compelling solutions that meet the needs of today's active mobile consumers, who demand more out of the products they use. Charge your devices up to 4x faster than with a conventional charger thanks to a series of algorithms to establish what power level is needed at any time. And it is also backward-compatible with Quick Charge 1.0 Technology and Quick Charge 2.0 devices, and it support a broad range of connectors:Quick Charge 3.0 can be implemented with USB Type-A, USB Type-C, or proprietary connectors. Perfect Combination: Qualcomm quick charge 3.0 3 port car charger + 3 ft 2 in 1 micro and type c usb cable with max 3A. 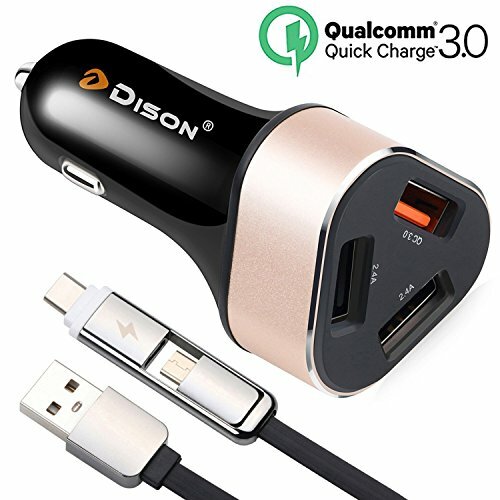 Qualcomm Quick Charge 3.0 + Intelligent Technology: 3 Port Car Charger includes One Quick Charge 3.0 port + Dual 2.4A Output Smart Adaptive Charging（AI Power）port. This QC 3.0 car phone charger charges 75% faster than standard charger. Maximum Durability + Ultra Protection：Ultra gold aluminium alloy frame can protect against drops, bumps and scrapes. Safety Protection : Intelligent circuit design protects against short circuiting, over-heating, over-currents, and over-charging. Charging stops automatically when battery is full. [12-Month Warranty]Universal Compatibility : This QC car charger is suitable for all devices such as iPhone, iPad, Android devices like Samsung Galaxy, Motorola, LG, SONY, Blackberry, MP3 Players, eBook readers, just to name a few.